TORONTO - While Canada's world junior team is a long ways away from show time, two players have already shown they're worthy of that moniker. 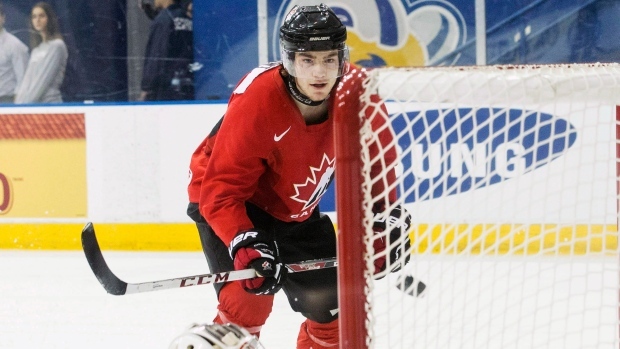 Forwards Jake Virtanen and Brayden Point were anointed "Show Time" by teammates in the dressing-room Sunday after Canada's second exhibition game against local university all-stars. Virtanen and Point were among the players who acquitted themselves well over the weekend as selection camp drew to a close. Virtanen's two goals and four assists and Point's three goals and two assists helped them stand out in the crowd and made them feel pretty good about their chances of making the final 22-man roster. "You look at the roster and there's some pretty big names and guys that have done really well for themselves in the past," said Virtanen, a first-round pick of the Vancouver Canucks in June. "Coming into this camp it's just showing yourself and playing well. I think so far as a team we played well and personally I think I've done pretty well. I think just showing my 200-foot game and just trying to be a good player all around the ice is what I've been trying to do." Virtanen, who plays for the WHL's Calgary Hitmen, scored one of his two goals Sunday on a perfect wrist shot just under the cross-bar. After missing Canada's summer camp while recovering from shoulder surgery, the Abbotsford, B.C., product is glad just to be healthy and playing like himself again. "Coming into this I knew that I had to really show my stuff," Virtanen said. "Especially in the Subway (Super) Series it was huge for me. I know I had to show the coaching staff and the whole staff that I definitely want to be on this team and I'll do anything to be on it." The other goal Virtanen scored Sunday came after Point dazzled defenders and dished the puck to him to put into an empty net. Point, a Tampa Bay Lightning prospect playing with the WHL's Moose Jaw Warriors, was in playmaking and scoring mode in the two games. Coach Benoit Groulx referred to him as "relentless" and said he likes "a lot of things" about him. "He's playing with a lot of passion and competes," Groulx said. "He's got a flair out there, a lot of anticipation. He's been good. He's been very good." Groulx gushed about Point more than any other player over the weekend. That's not bad for him. "If he saw something he liked, then that's good for me," Point said. "You always want to do your best and impress." Neither Virtanen nor Point were considered a sure bet to make Canada when selection camp opened Thursday. But they more than survived the first round of cuts and will be at Meridian Centre in St. Catharines on Monday when main camp opens. Still, forgive Point for not wanting to get ahead of himself and think he has already made the team. "There's a lot of guys that played well, so you never know," Point said. "I'm just going to try to keep working hard. If I can keep going through the process, then I'll keep working hard." Robby Fabbri, a St. Louis Blues prospect playing with the OHL's Guelph Storm, stood out as well with two goals in Saturday night's exhibition. And Frederik Gauthier, the Toronto Maple Leafs' first-round pick in 2013 who's with the QMJHL's Rimouski Oceanic, looked more comfortable in the offensive zone than he has in the past. Nick Ritchie, whom the Anaheim Ducks took in the first round with the pick they got from the Ottawa Senators in the Bobby Ryan trade, also made an impression because he can play on the edge. That's a tough mix and a thin line to toe, but Groulx thought Ritchie has done a nice job of that so far. "You have to watch it," Ritchie said. "You can't take too many penalties. I think I did a pretty good job of that, not taking that risk, just playing hard and knowing to stay on the right side." Ritchie could be on the borderline of making the roster, too, but there's time before Hockey Canada has to make that decision. Then there are the no-doubters, the several players who didn't need to take the ice in one or both of the game at Mattamy Athletic Centre because their spots are safe. Injured centre Connor McDavid is a lock as he continues to progress from a broken bone in his right hand, and he's joined by forwards Sam Reinhart, Anthony Duclair, Max Domi and Nic Petan. Defencemen Darnell Nurse, Josh Morrissey and Madison Bowey can also feel good about making it. In goal, Canada only brought Zach Fucale and Eric Comrie to camp, and unless something unforeseen happens, Fucale figures to be the starter. Comrie had a 22-save shutout Sunday in Canada's 6-0 win over the Toronto CIS Selects team. At forward and defence, injuries could affect Canada's short-term future as forward Michael Dal Colle missed Sunday's exhibition game and defenceman Joe Hicketts left as a precaution after being hit from behind into the boards. Groulx said the team did not want to take chances with either player.